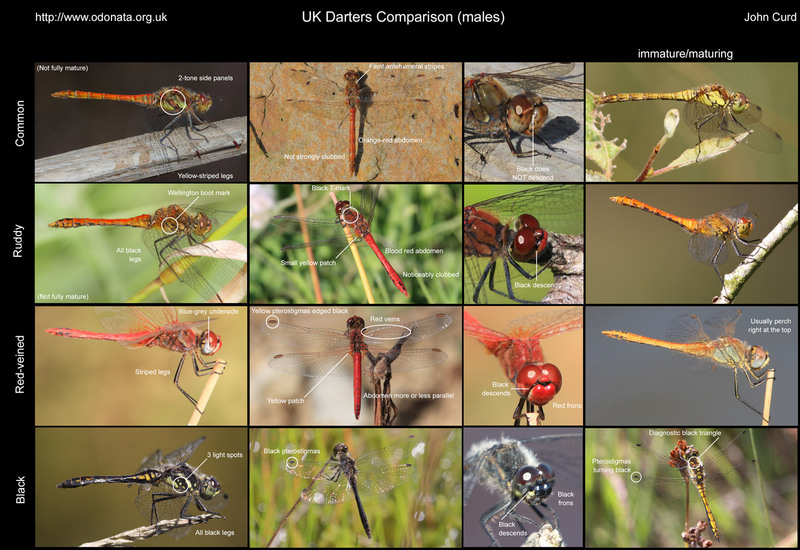 The UK is home to four resident Darters (Sympetrum). two of the males, the Common Darter (Sympetrum striolatum) and Ruddy Darter (Sympetrum sanguineum), are relatively widespread and relatively similar, so are a frequent source of confusion. The remaining two Darters are more restricted in their distribution. Of these, males of the Red-veined Darter (Sympetrum fonscolombii) are similar enough to the first two to add to the confusion. Males of the fourth, the Black Darter (Sympterum danae), are distinctive save for the immature form, which can cause confusion. Here’s my attempt to clarify the males.